Did you wear Start-Rite Shoes? Now in its eighth generation family business, Start-rite have been trusted by generations of parents to care for their children’s feet. With a heritage dating back to 1792. The history dates back to 1792 with the birth of the modern shoemaking industry in Norwich, where Start-rite head office is still based today. James Smith was a cordwainer (or leather worker) based in a small shop behind Norwich market. He was the first shoemaker in the country to offer an alternative to bespoke footwear that few could afford by offering ready-made, off-the-peg foot-wear to a wider audience. The name “Start-rite” was first used in the early 1920s by Quant & Son, a shoe retailer in Bury St Edmunds and purchased by Southalls for exclusive use in 1921. The decision was also taken at this time to concentrate on marketing and selling products, with investment in advertising and the recruitment of the company’s first London-based sales rep. Having picked up on public concerns about healthcare and particularly children’s fitted footwear, more emphasis was placed on the company’s newest children’s brand “Start-rite” with the appointment of a dedicated production manager. Southalls was the first footwear manufacturer to make a practical contribution to the prevention of damage to young feet. In 1928, the company commissioned an investigation into schoolchildren’s feet to confirm their belief that children should be catered for differently to adults. 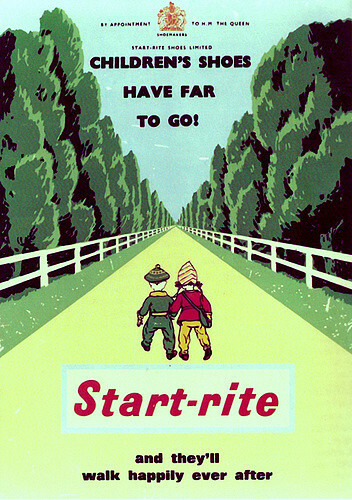 The iconic Start-Rite twins were first famously reproduced in a series of posters and press adverts which ran through the late ’30s and ’40s, the brand is still recognised today featured at the heart of the Start-rite logo as the hallmark of well-fitted, quality shoes for children. By the late 1940s, Start-rite shoes were in such high demand that retailers were limited to strict quotas of supplies. In 1943 James Hanly, then chairman, commissioned a nationwide survey of children’s feet with the help of medical research experts, schools and health authorities. 450 children had their feet measured and tabulated. The results proved that, whilst Start-rite shoes were better for children’s development than other brands, there was further scope for additional improvements, notably shoes which would allow tiny feet to grow through to late teenage years without damage, and the need for the shoes to be fitted by trained people. In 1952 the company took the brave decision to stop manufacturing adult footwear and concentrate purely on children’s needs and the Start-rite brand. They recognised no two children’s feet were the same, so huge investment was made into special “lasts” specifically for children’s sizes, available in multiple width fittings, and based on the natural shape of a child’s foot. The company also introduced a “heel stiffener” to help with balance and growth. Then in 1955 Start-rite shoes achieved another first when, as supplier of footwear to the Windsor children, it was granted the Royal Warrant by Queen Elizabeth. The Start-rite brand was so important to Southalls as a business that the decision was taken in 1966 to officially adopt Start-rite as the trading name. As a result, both the business and brand are known as Start-rite today, although the parent company remains James Southall Ltd and both names are proudly displayed outside the Norwich head office to this day. I remember that my mother insisted on Start-rite shoes for me and when it was time I was taken into Mr Smith’s shoe shop in Drayton to be measured and fitted. The shop always looked dusty and chaotic to me and gave the appearance of being none too clean. But this was the local shoe shop so that its where we went. 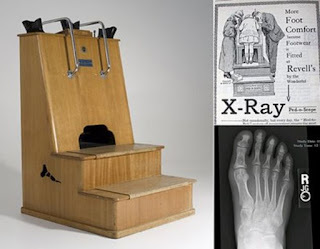 Mr Smith would measure my feet with the special board and tape, the desired shoes were fitted and then I was transferred to the strange large X-ray machine so the fit could be checked. Once fitted and purchased the shoes were then packet in an oblong brown paper bag with a picture of the twins on it so the shoes could be carried home. But it was not until we were outside the shop that I was told that I had better take care of these shoes as they were expected to last longer than the last pair! On 19/11/1960 the number one single was It's Now Or Never - Elvis Presley and the number one album was South Pacific Soundtrack. The top rated TV show was Bootsie & Snudge (Granada) and the box office smash was Psycho. A pound of today's money was worth £13.68 and Tottenham Hotspur were on the way to becoming the Season's Division 1 champions. On 19/11/1961 the number one single was Little Sister/His Latest Flame - Elvis Presley and the number one album was Another Black & White Minstrell Show - George Mitchell Minstrels. The top rated TV show was Coronation Street (Granada) and the box office smash was One Hundred and One Dalmations. A pound of today's money was worth £13.25 and Ipswich Town were on the way to becoming the Season's Division 1 champions. On 19/11/1962 the number one single was Lovesick Blues - Frank Ifield and the number one album was West Side Story Soundtrack. The top rated TV show was Coronation Street (Granada) and the box office smash was Lawrence of Arabia. A pound of today's money was worth £12.89 and Everton were on the way to becoming the Season's Division 1 champions. On 19/11/1963 the number one single was You'll Never Walk Alone - Gerry & the Pacemakers and the number one album was Please Please Me - The Beatles. The top rated TV show was Coronation Street (Granada) and the box office smash was The Great Escape. A pound of today's money was worth £12.64 and Liverpool were on the way to becoming the Season's Division 1 champions. On 19/11/1964 the number one single was (There's) Always Something There to Remind Me - Sandy Shaw and the number one album was A Hard Day's Night - Beatles. The top rated TV show was Coronation Street (Granada) and the box office smash was Dr Strangelove. A pound of today's money was worth £12.24 and Manchester United were on the way to becoming the Season's Division 1 champions. On 19/11/1965 the number one single was Get Off Of My Cloud - Rolling Stones and the number one album was Liverpool. The top rated TV show was "Coronation Street (Granada) and the box office smash was The Sound of Music. A pound of today's money was worth £11.69. The big news story of the day was Take Your Pick (AR)".